We tested the hypothesis that the effect of forest basal area on tree growth interacts with macro-ecological gradients of primary productivity, using a large dataset of eucalypt tree growth collected across temperate and sub- tropical mesic Australia. To do this, we derived an index of inter-tree competition based on stand basal area (stand BA) relative to the climatically determined potential basal area. Using linear mixed effects modeling, we found that the main effects of climatic productivity, tree size, and competition explained 26.5% of the deviance in individual tree growth, but adding interactions to the model could explain a further 8.9%. 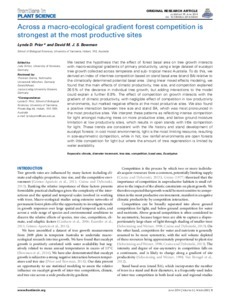 The effect of competition on growth interacts with the gradient of climatic productivity, with negligible effect of competition in low productivity environments, but marked negative effects at the most productive sites. We also found a positive interaction between tree size and stand BA, which was most pronounced in the most productive sites. We interpret these patterns as reflecting intense competition for light amongst maturing trees on more productive sites, and below ground moisture limitation at low productivity sites, which results in open stands with little competition for light. These trends are consistent with the life history and stand development of eucalypt forests: in cool moist environments, light is the most limiting resource, resulting in size-asymmetric competition, while in hot, low rainfall environments are open forests with little competition for light but where the amount of tree regeneration is limited by water availability.